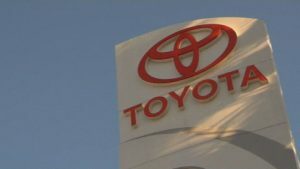 (NBCNC) – Toyota is recalling nearly 188,000 vehicles over concerns that airbags may not inflate in a crash. The recall involves 2018 and 2019 Tundra pickups and Sequoia SUVS and 2019 Avalon sedans. The automaker says the control computer can erroneously detect a fault when the vehicles are started, which could keep the airbags from deploying in a crash. Toyota will inform owners and dealers will update the airbag control software. The recall is expected to begin October 22.